Sidling up to the crowded bar at The Dutch, my friend Richard looked at me, dumbfounded. It had been ages since he'd seen me order a Napa Valley white wine. Back in the late 80s and 90s he wouldn't have thought twice about it. Super ripe, oaky California white wines, especially Chardonnay, fit right in to the scene. Music, fashion, everything was over the top: big hair, big cars, oversized earrings, neon spandex leggings, tight leather miniskirts, shoulder pads and pumps in every color. My friends and I would sip on those big, fat oak bombs while bopping along to Madonna and George Michael on MTV, our teased up feathered hairdos sparkling with glitter hairspray. It was only a matter of time before I outgrew those, shall we say, 'memorable' outfits. My fashion sense was becoming less flashy and my taste in wine was also shifting towards a more balanced style. As I discovered great restaurants and began cooking, I wanted nuanced wines that wouldn't overpower the food. I turned to Europe and found Albariño, Riesling, Grüner Veltliner, Verdicchio, Assyrtiko — not always easy to pronounce — but fresh, unoaked, and invigorating wines to enjoy with a meal. Even French Chardonnays, mostly oak-aged, were nothing like the heavy California ones I knew. Years went by and I stuck to my European white wines (while occasionally dipping into Oregon Pinot Gris and spent a whole summer sipping New Zealand Sauvignon Blancs). But every now and again I would come across a California white wine that surprised me with its subtlety and elegance. In 2012, I began working at a Manhattan wine shop and I started to notice that many Napa whites were being vinified with a distinctly lighter touch and customers were interested in these lower-alcohol, food-friendly wines that emphasized fruit and acidity over alcohol and tannins. As Master of Wine Mary Gorman McAdams explains, "Judiciously used, oak can add great complexity to a wine, enhance its structure and influence its ability to age. Getting the match right is part of the winemaker's craft of creating a balanced, harmonious and enjoyable wine." Grape varieties that make leaner styles of whites (wines that may not spend any time in oak barrels) are becoming more popular throughout Napa too. 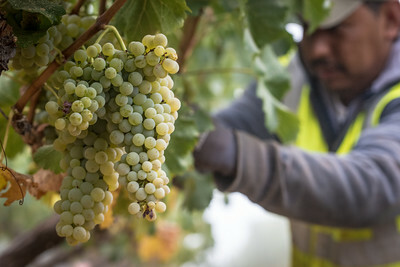 Sauvignon Blanc is the second most planted white grape variety in Napa and it's starting to be planted on better sites and given more care in the vineyard and in the cellar. Karen MacNeil, author of The Wine Bible, says that there's an "emergence of a whole new class of Sauvignon Blancs — wines that are bright, mineraly, sophisticated and complex, often with a ravishing raciness and richness." And with the exorbitant cost of land in Napa, dedicating a plot to something other than the King (Cabernet) or the Queen (Chardonnay) is risky business. Napa winemaker Dan Petroski, whose Massican white wines are inspired by the great whites of northern Italy, explains, “Whites are tough to produce in Napa now if you’re concerned about economics. Whites grown on great red wine soils make wines with depth and complexity but the problem is that wine drinkers are far more willing to pay big bucks for a rich red than a white." Fortunately, that hasn't stopped Dan or others from continuing to invest in making interesting and original white wines. 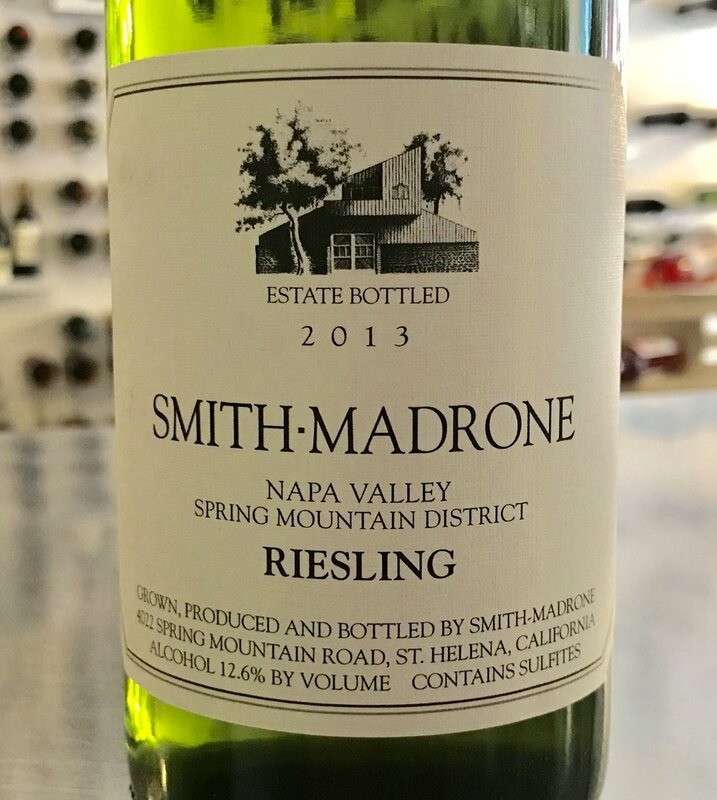 Many Napa winemakers are championing out-of-the-box varieties like Ribolla Gialla, Riesling and Marsanne (see my 'off the beaten path' recommendedations below). Trends come and go, but quality is timeless, whether in fashion, music or wine. Napa Valley is returning to its roots and offering a plethora of delicious, food-friendly white wines to seek out and enjoy. What does one do with a case of delicious Napa white wines (and a few rosés because it is summer, after all) sent from Napa Valley Vintners? Throw a party! On a hot summer night, eighteen of my friends gathered to pair an assortment of refreshing Napa white wines with everything from a sweet and spicy mango salsa to rich cheeses, salads and Lisa's Lobster Rolls made with celery, mayo and lemon on a buttery, grilled bun. That wine I was sipping at The Dutch? It was a Matthiasson Linda Vista Vineyard Chardonnay, aged in neutral barrels, opulent and textured with a bright acidity and a crisp, mineral finish. Be sure to check out their fabulous Ribolla Gialla too. Now it's time to have your own summertime fun with a crisp and refreshing Napa Valley white wine. Below are some Wine Chef favorites with food pairing suggestions. Bon Appétit! Matthiasson 2016 Linda Vista Chardonnay ($29) - Aged in neutral barrels, this crisp Chardonnay is a pure expression of California fruit balanced with bright, mouthwatering acidity with a very mineral finish. Start your night off with this wine, served with cured meats, cheese, olives and dips and Chicken With Cardamom, Cinnamon, Cloves and Caramelized Onions. Freemark Abbey 2016 Chardonnay ($25) - Lively and refreshing with notes of tropical fruits along with citrus and green apple. The wine shows great complexity, creaminess, and elegance — subtle and well-balanced — with just a hint of its well-integrated oak. Enjoy with cheeses and Cod With Clams And Butter Beans. Mayacamas Mt. Veeder 2016 Chardonnay ($50) - Mayacamas’ vineyards are way up in the Mayacamas Mountains, bordering Sonoma where the soil is ancient, pushed-up seabed. Known for their impressive Cabernet Sauvignon, they also make a beautiful Chardonnay. Vinous gave it a score of 95 and called it "flat-out gorgeous." James Suckling calls it "a bright and vibrant chardonnay with sliced apple, pear and cream aromas and flavors. Hints of yogurt and vanilla bean. Long and flavorful." I would pair this wine with a full flavored fish, like salmon, tuna or swordfish. 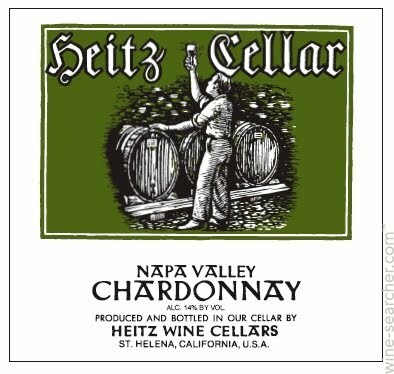 Heitz Cellar 2015 Chardonnay ($27) - The iconic Heitz Cellars has been making Chardonnay since 1961. "We use oak sparingly to let the flavors and the flintiness from the terroir shine," says Owner Kathleen Heitz. "Our Chardonnay has a classic fruitiness and richness on the palate that captures the essence of the varietal." Find the wine at Grape Collective, now on sale for $19.99, a steal! Goes beautifully with Corn and Tomato Soup. Ehlers Estate 2016 Sauvignon Blanc ($35) - A terroir-driven style of Sauvignon Blanc, the wine has been aged in stainless steel tanks and neutral, used French barrels. Bone-dry and full-bodied, with lively acidity, and rich, floral, mouth-watering flavor. Perfect for all of your summertime picnics. 100% organic, this wine is the gold standard for Napa Sauvignon Blanc. Pair with Steamed Clams With Corn, Tomatoes, Mushrooms and Bacon. Davis Estates Private Reserve Sauvignon Blanc ($35 on their website) - Coming from a small, family-owned estate in Napa's Calistoga, the tantalizing aroma has hints of grapefruit and grass. Supple notes of citrus and a touch of melon complement the wine's crisp acidity. Pair with a Lemon Shrimp Risotto. Priest Ranch 2014 Grenache Blanc ($22.99 at Grape Collective) - The historic Priest Ranch is now part of the Somerston Estate, a property of dramatic hillside vineyards. The wines of Priest Ranch are blends of several vineyards and show the diversity and complexity of the property. 2016 was a near-perfect growing season and this Grenache Blanc, 100% fermented in stainless steel, is a study in bright fruit and elegant aromatics. Flowers jump out of the glass, buoyed by ripe, white fruit, like peaches and melons. The palate is sharp with good acidity and minerality. Pair with Priest Ranch’s Grilled Four-Onion Pizza. 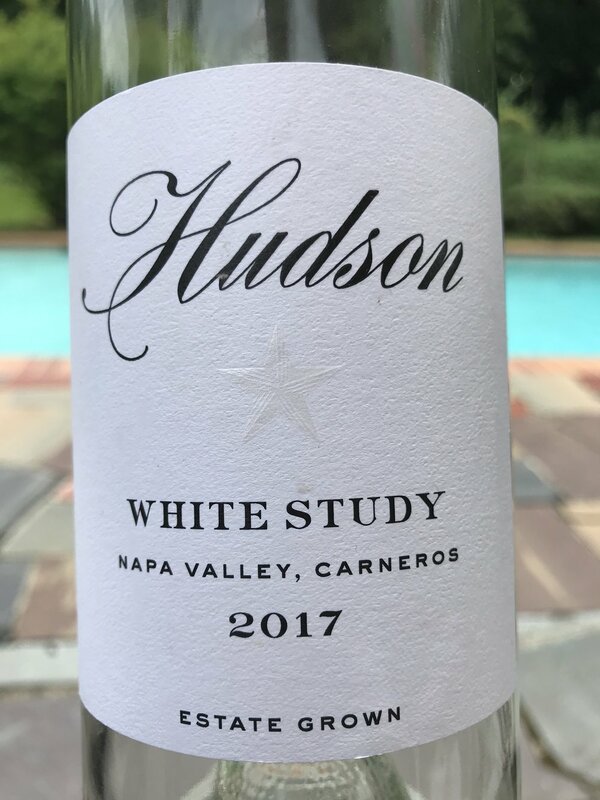 Hudson 2017 White Study ($36 on their website) - Hudson Vineyards lies in Napa Valley’s Carneros District where the cooling breezes off the Bay of San Francisco allow the grapes a longer time to develop flavor and intensity, without sacrificing acidity. This interesting blend of Ribolla, Arneis, Friulano and Albariño is made by fermenting each variety individually in a mix of 50% stainless steel barrels and 50% neutral oak barrels. The wine has an earthy minerality, balanced by hints of tropical fruits and spring herbs with a lovely texture and body on the palate. Pair with Lisa's Famous Guacamole And Savory Corn Cakes. 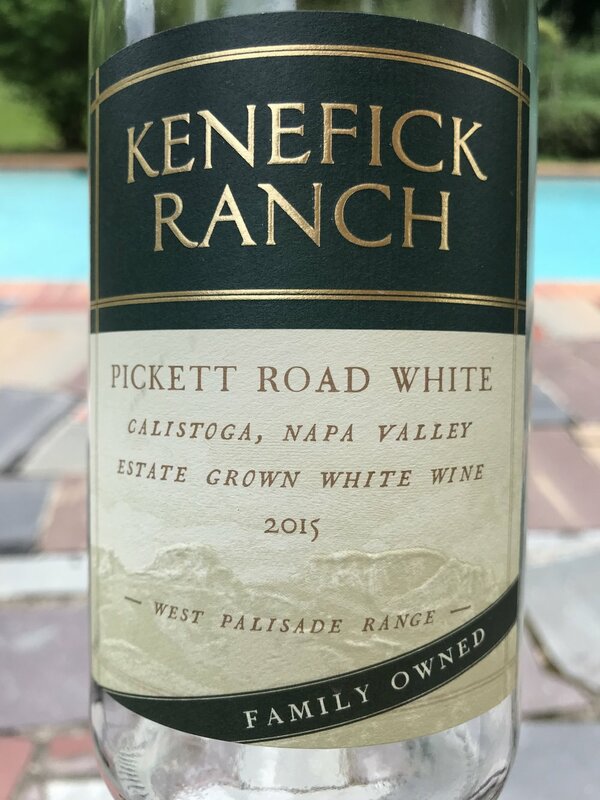 Kenefick Ranch 2015 Pickett Road White ($24 on their website) - Dr. Kenefick was a practicing neurosurgeon in San Francisco when he first visited and fell in love with the Napa Valley. Eight years later, he founded this remarkable property, a 250-acre Calistoga ranch set within two mountain ranges. His Pickett Road White is a deep yellow color and made with Rhône varietals of 60% Granache Blanc, 30% Marsanne and 10% Viognier. On the nose, savory nuances of tomatoes and lime zest entice you to take a sip. The palate has a crisp and well-balanced mouthfeel with flavors of lemon and lime, and savory, raw tomato. The website says that Dr. Kenefick enjoys sipping this white wine on his patio in the summer. I think you will too, along with your favorite barbecued foods, like Chili Rubbed Baby Back Ribs. 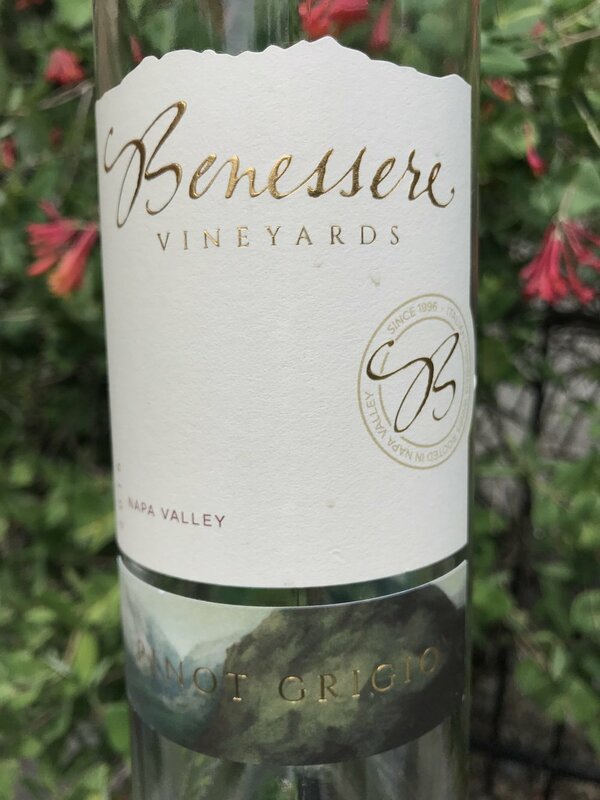 Benessere 2016 Pinot Grigio ($25 on their website) - Full of rich aromatics of jasmine, white peach, grapefruit zest and lemongrass, this wine has a mouthwatering acidity and a weighty body. 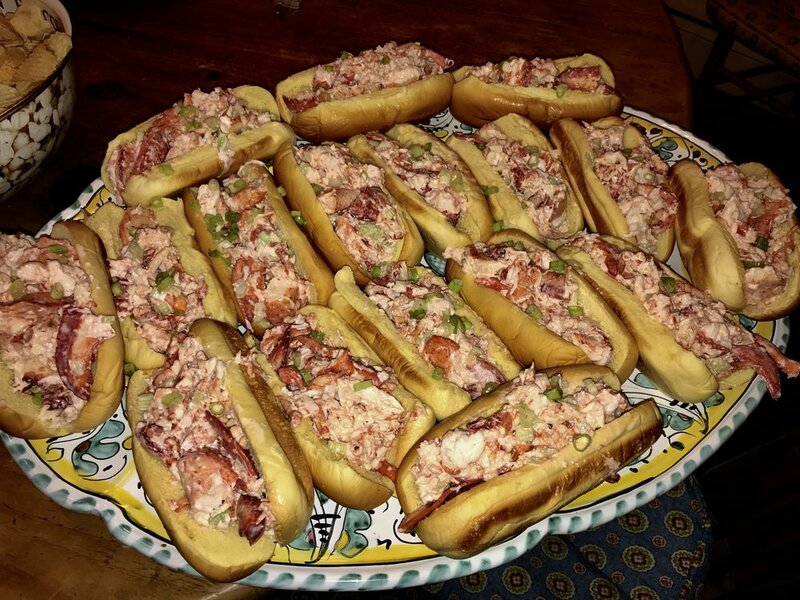 It finishes clean and refreshing and goes particularly well with creamy cheeses and lemony, buttery lobster rolls.